On March 6, a third party contractor retested Gale Hall for mold following student concerns about the air quality of their dorms possibly affecting their health. As was revealed in a recent Sandspur article, students complained that they suffer from cough, sinus and throat issues, and exacerbated asthma symptoms, and believe it is associated with mold growth in their residential buildings. Ken Miller, vice president of public safety, said having the third party test Gale Hall will allow them to definitively state whether there is an issue. “If there is, they will outline it and provide guidance on how to best address it. If there isn’t, it should lend confidence to what we have stated for some time,” he said. “We have asked them to look at anything relevant to [indoor air quality] issues inside of the building. This may include the HVAC system, windows, roofing, etc. but it will also highlight residents’ behavior inside of the building that continues to negatively impact their living space. Some of the items that we have seen recently, such as leaving windows open, altering the thermostats, and personal housekeeping will also be noted,” he said. Miller said that Campus Safety is willing to test the living space of any student upon request. When requesting a test, it is preferred for students to contact Residential Life. Students will then have to provide a reason for why they are requesting the test, such as high humidity, condensation, or staining. Residential Life will then contact Campus Safety to conduct the test. However, a student claimed that he has not had these conversations with Residential Life. Ryan Tillotson ‘20, a resident of Gale Hall, said that when he first reported the stains on his walls, his House Manager, Collin Esquirol ‘18, submitted a report. From there, though, he said no one from Campus Safety or Residential Life ever contacted him. “I got to my room as they were leaving and they said it was taken care of cause I didn’t see any mold left, but there wasn’t any follow up or anyone asking if it actually got taken care of,” said Tillotson. “In addition, they came through and did air quality checks in all of our rooms but we were never contacted about that even happening and then, when it did, no one told us what the results were or what happened,” he said. The Sandspur requested and received redacted copies of Gale Hall air quality test results, provided by Scott Rayburn of Campus Safety. When an air quality test is conducted, a sample is taken from outside the building, inside the general living space, and then inside the room. These three data points are used to compare and detect any problems. The air outside of Gale Hall had a total fungi count of 3,910 per cubic meter, while the air inside of the first floor hallway of Gale had 290 per cubic meter. One room had a fungi count of 2,450 per cubic meter. Within that room, the highest single spore found was the species Aspergillus and Penicillium. The count of these spores outside of Gale was 200 per cubic meter, and 100 per cubic meter in the first floor hallway. Exposure to Aspergillus and Penicillium can cause allergic reactions, lung infections, and infections in other organs. The Sandspur gave copies of these results to a local environmental air quality and moisture testing service, Air Quality Assessors, for analysis. One of their mold specialists, John Scarry, said that if the number of spores exceeds 1,000 per cubic meter, that is an unacceptable amount. Scarry also said that the difference in these spore counts between the air outside of Gale, the first floor hallway, and the room in question indicates that Aspergillus and Penicillium are growing within the living space. According to the Centers for Disease Control, a federal health protection agency, sampling to determine the type of mold present is unnecessary—if an individual is susceptible to mold and mold is seen or smelled, it is a potential health risk and should be removed. 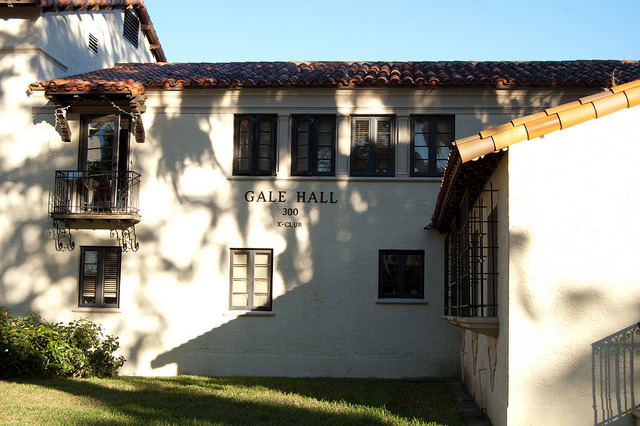 The residents of Gale Hall have requested a meeting with Residential Life, Fraternity and Sorority Life, Campus Safety, and Facilities to discuss ongoing questions and concerns. A date and time for this meeting has not been announced.